In my commitment to eating seasonally this winter, I've discovered barley. My mom makes a great barley soup & to be honest, I hadn't considered its many other possibilities. If you can get your hands on quick cook barley it will decrease cooking time slightly. I used pearl barley & it was about 45 minutes from start to finish. Heat large pot & oil on stove at medium heat. Add onion, paprika, garlic, & oregano, cook until soft (aprox three minutes). Add mushrooms & chickpeas, about two minutes. Add barley & 1.5 cups vegetable stock (if using bouillon cube, replace stock with water), bring to a boil. Add peppers, celery, lower heat & cover. Let simmer until barley is soft (approx 30-35 minutes). If more liquid is required, add last 1/2 cup vegetable stock - it's ok if there's still a bit at the end. In separate bowl, combine bread crumbs, Italian spice, & dill. Preheat oven at low broil. 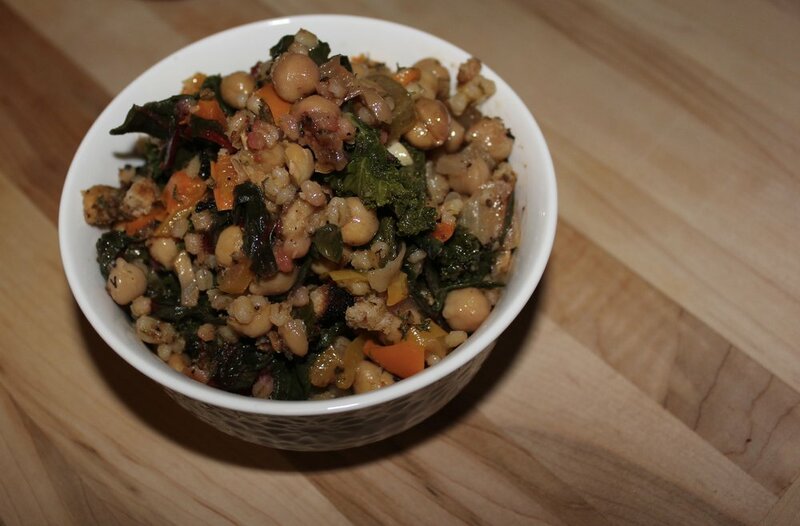 Once barley is soft, add salt, Swiss chard, & kale. Stir until wilted. Remove from heat & transfer to a 8.5" x 11" baking pan. Sprinkle bread crumb mixture on top. Broil approx 5-10 minutes or until bread crumbs get crispy.